"Good Advice on What Not to Do, Not so Good On Advice of What to Do"
Interesting because of the female perspective tips here and there. However, if you want to improve the results of your texts and phone calls with women there are much better products out there. You will get better results from one of the top rated products in our text and phone game advice ranking. 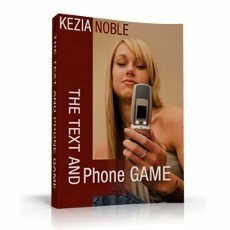 This is the only book giving text and phone advice from a female dating coach for men (Kezia Noble). It was a very quick read as it is pretty short. Let's get down to it. Throughout the book Kezia tackles a problem (or concern that men have) and gives you a generic strategy to deal with it. In this respect the book is pretty well structured, and Kezia obviously has fielded a lot of questions from men on texting and phoning women in her time. In the first two chapters most of the advice is good in terms of the guidelines she provides. It's practical and down to earth most of the time - which is good. If you can take principles, understand them, and apply them to how you do things yourself - then you can get a lot out of these. After the good general guidelines, Kezia gives example texts to use that are overall not the best examples. I'd give them 5 out of 10 overall. Some good, some moderate (most) and some pretty bad. The clearest example of bad ones were in the chapter on "Situational Observational Text". It's a great approach (as she mentions), and was originally designed many years ago by Sebastian Drake (of The Approach). However the texts Kezia describes don't do a good job of demonstrating how to do it. Interestingly, I noticed that most of the texts in this chapter look a lot like the texts I've had sent to me by women chasing me, or trying to impress me over the years. That's where the problem comes in. This issue of the texts being a bit on the girly side is repeated in the chapter on "Question Texts" and "Ping Texts". Incidently, the "Ping texts" from this chapter are pretty much all based on texts used and taught by other dating coaches. No points for innovation here. As we're on innovation, there are some parts of original and useful advice in this book. They tend to come from the female mindset (more on that in a minute), and include ideas that I haven't seen in dating advice products before. Practical advice on when to call and how many times to call for instance. Some Thoughts on The Female Perspective.. Useful? As usual, the answer is that it depends. This is the first time I've reviewed some of Kezia's work, and she's one of a very short list of female dating coaches that focus on helping men. What were my thoughts on the result? Here's what I found with this eBook. Kezia does a good job of explaining what you shouldn't do and why in many cases. She doesn't do such a great job of explaining what you should do to get results, though. If you think about it this makes total sense based on the experience Kezia will have. As an attractive girl she is obviously used to getting sent a lot of texts and called a lot by guys. She has a lot of experience in bad things that guys have done that have gone wrong in this department. De facto. On the other hand, she doesn't have any experience in sending texts and phoning women to get dates and meet up with them later. Some of the male dating coaches I know have sent tens of thousands of texts over the years and made hundreds of phone calls. I'm certainly in that region. This is quite possible the reason behind this. Which may give you a hint as to where it will be most useful to get advice from women on dating women? I'm just thinking out loud here. This product comes across as a more thrown together. At 37 pages with large text it's pretty short, and there are a lot of spelling mistakes throughout it. Around 25% of the book is in general question and answer format (kind of like a F.A.Q.). I personally found some of this book interesting because of the female perspective tips here and there. Someone of an advanced level who likes to get new perspectives may feel the same way. However, if you want to improve the results of your texts and phone calls with women there are better products out there. Check out our ranking of text and phone game advice.